Cheapskate alert! The parking fee is $10 per vehicle (as of April 2015). You want to pack enough highlights for four hikes into one four-hour loop. And also, you’re not afraid of some crowds. Background you can feel free to skip: The crazy natural beauty at Minnewaska State Park Preserve is probably the worst-kept secret in the Hudson Valley. On a nice summer afternoon, you’re probably more likely to find solitude at Wal-Mart. But man, what a place. Minnewaska draws crowds for a reason. A trip to Minnewaska could be a leisurely stroll around the lake, or a day-long extravaganza with multiple vistas and mileage reaching double digits, whichever you prefer. The very nice New York State Minnewaska homepage features tons of great information to help you plan your day here, including a jam-packed trail map (the same one they’ll hand you when you pay at the guard shack on your way in). The New York-New Jersey Trail Conference map for this area is much easier to read, but you’d have to be willing to shell out some cash for it. There’s enough to see here that you could come every weekend for the summer and check out something new each time. And if you’re game for sharing your time outdoors with crowds of other granola munchers, you’ll have a hard time finding a more perfect spot than Minnewaska. UPDATE August 2015: The Castle Point Carriageway, used in Steps 10-14 below, is currently closed for construction. See the Minnewaska homepage for updates and a closure map. It should be open again before too long, but for now, no hiking allowed there, and Kempton Ledge will be inaccessible. Please drop a comment on this page if you find it open again. In the meantime, you can piece together a detour or different itinerary using the Minnewaska trail map, and here’s a link to another great Minnewaska hike that isn’t affected by the closure. Happy adventuring! (And thanks to Krista and Gabrielle in the comments for the alert!) We’re back in business! Thanks for letting us know with your very helpful comment, Siena! 1. From the Lake Awosting parking area inside the preserve (see “Directions to the trailhead” below), walk back down the entrance road, toward the guard shack where you just deposited $8. 2. Once at the guard shack, check out the information on the kiosk to your right, then turn right to head into the park on the main road. 3. In a very short distance, you’ll cross the Peters Kill stream. Directly afterwards, turn left onto the red-blazed Awosting Falls Trail. The stream burbles and drops off to your left on its way to the falls. 4. 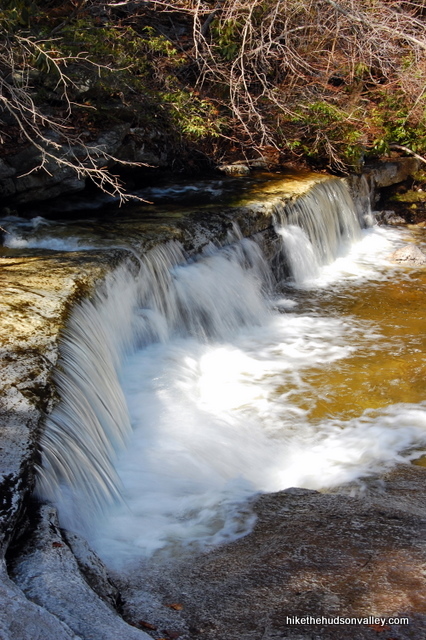 Continue down the Awosting Falls Trail as it meanders downhill all the way to an open viewing area of the falls. Awosting Falls drops 60 feet into a clear, wide pool with plenty of vantage points all around. Park yourself on some rocks and enjoy the show. 6. Enjoy the views as the gentle switchbacks of the Orange Trail take you up toward Lake Minnewaska. From the bottom of the Orange Trail to the first lake vista is about 20 minutes, with stops for pictures. 7. Stay on the Orange Trail until it ends just past the upper parking lots. Make sure you don’t wander into the parking lots and get lost, as my friends did when following this trail guide — the lots should stay on your left as you continue up the trail. Continue up the trail to the fence that offers a great overlook of Lake Minnewaska (the upper parking lot is now directly behind you), with the white cliffs rising up on the left and the visitor’s center neatly camouflaged on top. See it? 9. Follow the Red Trail down past the swimming beach. Not a bad place to take a dip, if it’s open and you’re so inclined. You’ll also stroll past a bathroom facility, which you’re welcome to take advantage of. We’ll wait. Otherwise, just keep hanging in there on the Red Trail. 10. About five minutes after the bathroom facility, take a right turn onto the blue-blazed Castle Point Carriageway. The sign lets you know that Kempton Ledge is just an easy mile away. 11. Enjoy the views of the Catskills off to your right as you gently ascend toward Kempton Ledge. 12. After about twenty minutes on the Blue Trail, you’ll arrive at Kempton Ledge, which is very well-marked, on your left. (Update July 12, 2014: Per Jules’ comment below – and since confirmed – it’s not so well-marked anymore, which is a real shame. That was one beautiful sign. The ledge, though, will still be easy to find – it’s that big, gorgeous, ledge-like ledge on your left.) Take some time to enjoy the gigantic view, clear across the Gunks to the Hudson Highlands. 13. After you’ve sufficiently marinated your eyeballs in that view, head back the way you came on the Blue Trail. 14. About five minutes after leaving Kempton Ledge, you’ll take your first right turn onto the intermittently yellow-blazed Millbrook Mtn Carriageway, which was marked during our visit in spring 2011 with a big ol’ sawhorse. (Jules of the Comments reports that the sawhorse is still there as of July 2014. Giddyup! And Siena reports that it’s now gone. Whoa.) Whether you see a yellow blaze or not, just take your first right turn. 15. A couple of other trails will merge into the Millbrook Mtn. Carriageway, but just keep heading straight, or as straight as possible. 16. About ten minutes after getting on the Millbrook Mtn. Carriageway, it dead-ends into the red-blazed Minnewaska Lake Loop. Take a right to head down to the water’s edge. 17. The Red Trail takes you right down to the water, where you get some great views back across the lake. 18. As you continue around the lake, the Red Trail gains altitude to start bringing you up on top of those beautiful white cliffs. Along the way, you’ll find another viewpoint off to your right, where you can step out onto the rocks and see clear across to the Skytop Tower at Mohonk Mountain House. 19. Just after that viewpoint, take a left at the fork to keep climbing and heading toward the cliffs. 20. A wide picnic area opens up in front of you. Head across the lawn, towards the lake, leaving the Red Trail behind. You’ll pop out onto the cliffs, where you’ll have an awesome view of the lake below and the Catskills beyond. 21. Keep heading around the lake. The trails up here become a bit of a tangled mess. Just keep sticking as close as you can to the lake, keeping it on your left and following the trails as they head around it. When you see some friendly red blazes again, hop back on the Red Trail and continue following it to the tip of the lake. 22. The Red Trail brings you to some (very scenic!) porto-potties straight ahead, with some private property off to your sharp left. Take the middle road, just to the left of the porto-potties. 23. You’ll see the parking lots off to your right, where the lazy people parked. Head down the hill to the lower parking lot. In the back-left corner of the lower lot, you’ll see our old pal the Orange Trail (Sunset Carriageway). Take a right onto the Orange Trail to head back down the hill, towards your car. 24. Take one last look at the views as you head downhill. 25. Boom! The Orange Trail pops you back out near the guard shack. Remember this place? Take a left at the shack to return to the Lake Awosting parking area. 26. When you get home, see if there’s anybody there who’s willing to give you a foot massage. You’ve earned one. Directions to the trailhead: From New Paltz, head west on Route 299. Follow 299 until it dead ends into Rt. 44/55, where you’ll make a right turn. Follow 44/55 past the hairpin turn under the Shawangunk cliffs and past the Trapps parking area on your right. Continue another 3 miles past the Trapps parking area to find the well-marked entrance to Minnewaska State Park Preserve on your left. Stop at the guard shack, pay the fee, then make an immediate right turn to make the short drive over to the Lake Awosting parking area, where you’ll leave your car. You can also get directions by checking out the Minnewaska State Park Preserve entry on the HiketheHudsonValley.com Google map. Hiked 9/21/18- It was chilly but still very crowded, especially around the lower waterfall and the upper lake. We walked right past Kempton Ledge not realizing it was the “money shot” and kept walking another 20 minutes or so. Once you pass under the power lines, go another five minutes for a even more beautiful flat granite ledge- with a nice boulder perfect to sit and eat lunch on. If you do want to stop at Kempton Ledge, it’s just a few minutes past the Hamilton Point Carriage Road trail marker. Also, they’re doing construction around the “lower” upper parking lots, so you can currently not walk through to the Orange blaze trail. Instead, keep walking along the lake until you come back to the first great lake view and then turn right and head up the orange trail back to the Lake Awosting parking area. Great hike! We loved it! Went there today, I had this page bookmarked but ended up doing my own thing, did the LA Trail (Forgot what color) from the parking lot, ended up detouring to the red trail and finally orange trail, was a wonderful day, must’ve did 10 miles in total. It is appalling Minnewaska park caretakers are not attending to maintaining the chemistry of the public restroom the odors are an atrocity. Would you mind sharing the name of the kid friendly trails please? Just following up on Dilara’s comment below. The sign is indeed for the Hamilton Point Carriage Road. You’ll take that short road to Hamilton Point Carriage Road. Once you dead-end onto HP, you’ll need to make a left. HP will dead-end onto Millbrook Mountain Carriage Road. You’ll need to make a left there as well. A few minutes on that and you’ll hit the Lake Minnewaska Loop. Just did this hike yesterday (Sept 22 2016 Autumnal Equinox). I wanted to say thank you thank you thank you for your amazing guide! I printed it it out and followed it to the letter and this was one of the most beautiful hikes I’ve been on! I LOVED IT! I am relatively new to hiking and suffering from some foot & shoulder issues, and this was really amazing for me. It was just strenuous enough for someone not in great shape like me. I love hikes near any kind of water, and this had a waterfall and a gorgeous lake, beautiful rocks to sit on and just watch the water. I went here with my friend and as we neared Kempton Ledge (which, yes, is still not marked) we saw about 4 hawks take off of a tree just above our heads. We ran into a biker who had just seen a friendly but huge black bear sunning itself on a rock (this was near the middle of #14 above). For me it’s an additional source of joy that no hunting, fishing or “harassment of wildlife” (as the sign at the entrance says) is allowed. No sounds of gunshots! Additional note: if this helps any of the other hikers out, there is a sign for #14 now (where you wrote “About five minutes after leaving Kempton Ledge, you’ll take your first right turn onto the intermittently yellow-blazed Millbrook Mtn Carriageway… Whether you see a yellow blaze or not, just take your first right turn.” The sign there now reads: “Hamilton Carriage Road” I tried to post a pic of the sign below, but it wouldn’t upload…. will try again in another post. Thank you again – will be doing this hike again very soon. Hike/stroll from the 1st parking lot after you pay is 10 minutes tops. Its a flat walk on pavement. Just make sure once you get there, you go down the dirt trail to the real falls as seen in the pictures. Some people turned back after seeing the smaller falls. I dont have the address, but google maps pointed me in the right direction when i typed in the falls. Thank you for the write up. My family and I followed it and was able to skip “cheat” part of the hike and drove up the mountain. Tough to walk so much with a toddler on your back. If you can, please add more pictures of each focus point so it makes it easier for us to find. Haven’t done the hike yet, but I just called the park and was told that the Castle Point Carriageway is open! I’ll confirm if I do it tomorrow. As of today, everything on this hike is open! Castle Point Carriageway and all. Other updates: That Kempton Ledge sign is definitely gone. It’s pretty clear what/wherethe ledge is, but there’s no sign. On the way back down from there, there’s no longer a sawhorse across that road, though there’s a sign that says, “To Hamilton Carriageway” or something similar. It’s also more ore of a hilly walk, but that was perfect for such a hot day, and going back to the swimming beach at the end was ideal! Thanks, Maria! I had to remove those flyovers because mapmyhikes.com, which used to support them, just decided one day to stop supporting them, thereby breaking about fifty links on this site (not really breaking them, I guess, but making them all point to the Golden Gate Bridge for some reason). I miss those things. Sigh. Hello! I went on this wonderful adventure today and enjoyed every moment. I did want to give you the heads up that the Castle Point Carriageway is closed for most of 2015 due to construction. Instead, I went up the Millbrook Mountain Carriageway and then looped back to Lake Minnewaska on the Millbrook Mountain Mountain Path. I then was able to complete the Lake Minnewaska loop after returning to the Red Loop Trail. The mountain pass is extremely fun, but it is definitely challenging. There were detour signs for the Castle Point Carriageway via the Hamilton Point Carriageway but I decided to follow my own path. All in all, a great day! I can confirm that the Castle Point carriage way is still closed as of yesterday! Thank you both for the information! I finally put an update at the beginning of the trail guide to alert people about the closure – sorry I didn’t get it out there when you first posted your comment, Krista! (And thanks for the nudge, Gabrielle!) Much appreciated – hope that helps other people to avoid having their hike interrupted unexpectedly. The good news is that the Millbrook Carriage Road is no longer under construction, although it still has the “big ‘ol sawhorse” as in your picture above from 2011. Therefore, the original directions are valid again. Note, however, there is a closure on the Hamilton Point trail, and even though it does NOT impact this hike, there are enough warning signs about it that it kinda makes you worry that it does. One other note: I did not see the Kempton Ledge sign (step 12) so it may not be there anymore, but the ledge is pretty easy to spot… just look for a rock ledge/outcropping on your left. Jules, thank you so much for this incredibly helpful feedback! I’ve just updated the trail guide in a few places based on your input. Really appreciate it, and so glad you had a great day out there! We did (part of) this hike yesterday, and it was beautiful! We went on a Thursday on purpose, to avoid big crowds, but it was still a bit busy in the afternoon. We ended up adding about 3.5 miles to the hike via various paths, taking us to a bit more quiet areas of the park with some beautiful views, would love to share that if you wish. I do want to point out, the yellow path (Millbrook Carriage Road) at point 14 of your description has been closed as per August 2013, because of repairs to the Hamilton Point carriageway. The only option now is, after enjoying the views of the Kempton Ledge, to completely walk down the blue path (Castle Point Carriageway) again, until you meet the red one (Minnewaska Lake Loop) where you turned off before at point 10, turn right there and and just follow that along the lake and you’ll pick up your description again at point 16. Thanks so much for the helpful information, Fabian! I’ll update the trail guide at point 14 with a pointer down to your directions. Much appreciated! And I’d absolutely be game for hearing recommendations on other nice spots to visit in the park. Thanks! You are very welcome with respect to the updated directions, glad to help others also enjoy this great hike. For our additional miles added to the hike, it is easiest to explain using the official trail map by NY State Parks (http://www.nysparks.com/parks/attachments/MinnewaskaParkMap.pdf): after coming back from the blue CP to the red LM trail (around step 14 above), we followed LM along the like until we met with MC (yellow trail). We followed MC around the mountain, with some great views on the right side. At the end of MC, yet another point with amazing views to the southeast (perfect spot for a long break with some food and drinks! ), we took the footpath MM (red trail) back towards LM and picked up the route above at step 17/18. Point to note: MM is a footpath, not a wide carriageroad, and had some parts that were steep and harder to walk over. However, a lot more quiet than the rest of the park!